To get your videos in your Camcorder to play on your PC or any other media player is so much fun, especially on big and high definition screens. In some cases, videos are encoded in MOD format. However, it is not always trouble-free to stream videos from Camcorder to DVD player or other media players. If you are a tech geek on video codec, you may well know the root cause about this. Unfortunately not everyone is as lucky as tech geeks but never mind, this post will help to answer your puzzles and share with you some worthwhile solutions. Obviously as it can be seen from Wiki, MOD and TOD are informal names of tapeless video formats used by JVC (MOD and TOD), Panasonic (MOD only) and Canon (MOD only) in some models of digital camcorders. To put it in a nutshell, videos recorded by Camcorders are often contained in MOD format. Videos are encoded in MOD format in Camcorders, why MOD files cannot be played directly on media players? Though in fact MOD files are exactly MPEG files in disguise, they may fail to play on many existing media players such as Windows Media Player or many other top tier video applications. If you simply change the extension name to MPEG, oftentimes you will receive a video that is able to play but has no sound. Therefore, the best way to make sure that all MOD files can be played on media players or DVD players is to convert MOD to MPEG with the help of video converters. Tons of video converters are available and I will introduce you the most powerful video converter and an online video converter for your reference. About how to convert MOD to MPEG, Leawo Video Converter is highly recommended here. It is capable of converting files quickly and the output quality is reserved 100% as original files. Users will not experience any quality loss at all. This program also provides a lot of advanced features to personalize the file before conversion, for example, set aspect ratio, codec, trim the file, crop the file, add subtitles, and add watermark etc, all of which highlight the overall performance of this program. Below is a step-by-step instruction on converting MOD to MPEG using Leawo Video Converter. Click below buttons to download Leawo Video Converter. After downloading completes, install the program on your PC. Step 2: Export videos from Camcorders and import them to the program. On the program interface, move to the “Convert” page, click “Add Video” from the menu bar to import your MOD files to the program. As you know clearly, our target format is MPEG or MPG. Now click “Change” from the format dropdown menu. Tons of formats will be displayed for your selection. Step 4: Select MPEG as the output format. Enter key words MPG on the quick search box to locate the format. Here we use MPEG-2 Video. Step 5: Edit the MOD file before converting MOD to MPEG. A lot of people love to edit the file before conversion because this can enhance the overall output quality and user experience. Click “Edit” from the format dropdown menu to set codec, bit rate, aspect ratio. Click the editing icon next to the video to crop or trim the video, remove any noise, or add water marks to the video depending on your needs. Do whatever you want to make your output video perfect. Step 6: Start converting MOD to MPEG. Finally you can click the big green button on the upper left and set a directory to save the output file on the pop-up interface. After that, click the round button below to start to convert MOD to MPEG. Now you should be able to watch your MOD files on any media player after conversion completes. Since you may also ask, besides Leawo Video Converter, is there any online free MOD file converter that is capable of converting MOD to MPEG? Surely there are also tons of online freeware, among which I will take Zamzar as an example to show you detailed steps to convert MOD files. Step 1: Upload or copy URL to Zamzar. Step 2: Select the target output format. Step 3: Leave an email in order to receive the output file after conversion completes. 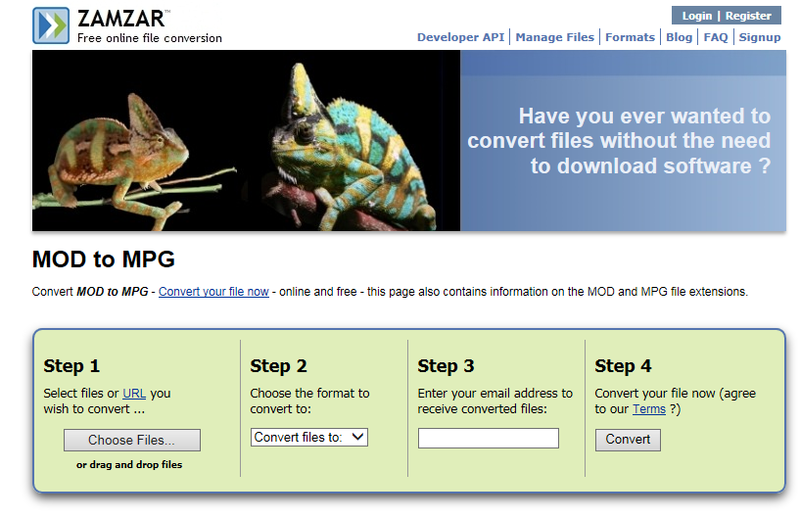 Sep 4: Click “Convert” to get your MOD files converted. Though online video converters are free, I have found that there are some drawbacks to online video converters. One problem is the privacy leakage risk. To convert your MOD to MPEG/MPG, you have to upload source files to the website, which threatens privacy leakage. Another problem is it takes ages to convert a movie if the network speed is bad. The worst problem is that lacking additional features to edit files for better output quality makes online video converters less popular to all than those powerful software programs such as Leawo Video Converter. All in all, I would rather take software programs to convert MOD to MPEG/MPG instead of taking advantage of free online MOD to MPEG converters, saving some time and energy to enjoy videos. Years of experience on converting videos makes me convinced that Leawo Video Converter is my best choice. What about you?